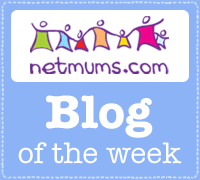 Older Single Mum: How They Made their Millions - Bananagrams Review and Competition. How They Made their Millions - Bananagrams Review and Competition. As we enter the last part of the Summer Holidays, with the children trying to kill each other and me trying not to murder them, we have, today, spent half of our time playing a 'PAIRSinPEARS' game picked up from one of the stands at the Britmums Live conference. I met the lovely Lesley from LSMedia fronting the stand and was also introduced to Rena Nathanson, one of the founder family members of what has become the global phenomenon that is BANANAGRAMS. There is a video HERE that, in less than ten minutes, gives you a really good feel for how her family took 'An anagram game that will drive you bananas' from an initial concept over a kitchen table in Rhode Island, USA, to selling more than six million games in 31 countries around the world. I'd never heard of it before! The video is from an American TV show called 'How I Made My Millions,' but Rena has now lived in London for 25 years and has actually been running the business from there since it began in 2006. 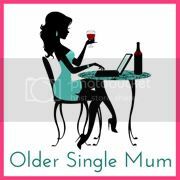 She has just been shortlisted for the MumpreneurUK Best International Trader Award 2012. Derived after an exhaustive game of Scrabble, by her father who adored games and loved creating them, they wanted something faster, more furious and fun for even the grandchildren to play, but still based around letter tiles and making free form words. It took time, but the family's obsession with their new game and with the belief and encouragment of their friends, it wouldn't be too long before 'SUCCESS' was spelled out for them! It has since made over $90 million and the company is involved with many childrens' charities. 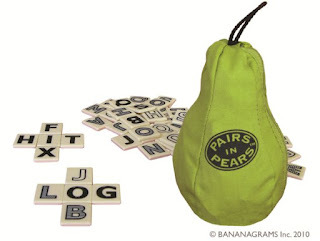 The PAIRSinPEARS game is a spin off of the original word play one - in a veritable fruit bowl of recreation which has been spawned, with Rena's children carrying on the family tradition of inventing educational entertainment. Some now come in Jumbo size and let's not forget the fabulous wordplay books, in which my seven year old can be truly absorbed for hours. If you want something to keep the little ones / big ones/ all of you upbeat and occupied for half the day - or, more likely - the remainder of the holidays, then check out the BANANAGRAMS 'Fruit Stand' Site The simplicity is the greatest feature. Even my three year old happily joins in with FRUITOMINOES and the all round spirited battles with our foreign language students, plus my partner and I have become (unusually) fiercely competitive with each other over the travel version ZIP-IT. I was very lucky to win the raffle of a range of their games at the conference and we've had the most enormous fun as a family - the very reason they were - and continue to be - inspired. That way, I can keep track of who has entered and a winner will be picked at random on Thursday 30th August. In the mean time, I'm off to thrash my sons again - but not in the way that most mothers usually feel we might by this point in the Summer Holidays! Disclosures - The PAIRSinPAIRS game was given to me for a review. I bought the ZIP-IT game and won the rest in their raffle! T&Cs: The prize is non-negotiable and the competition closes at midday. Any entries received after this point will not be included in the draw. One winner will be picked at random from all entries. Only one entry per person please. 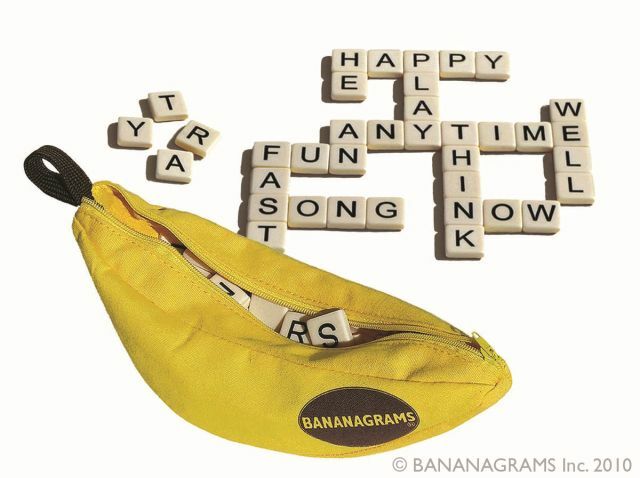 Loved Bananagrams so would love to play the new game! Great review Anya! Count me in - I think, one day, Little A would love this! Thank you. It'll be a random pick, but you'd love it too! Thank you Lesley. It was my pleasure to meet you and it continues to be my pleasure re the games. I already have Bananagrams. I was so pleased with it I took it on holiday, where I played with my children. They loved it. I won, and became very studious trying to create the best words. GG tried very hard, and got cross with me for winning. And the Bug became very absorbed with his letters, and proudly created "poo" "wee" and "willee"
Which is what's so great about it - thank you !